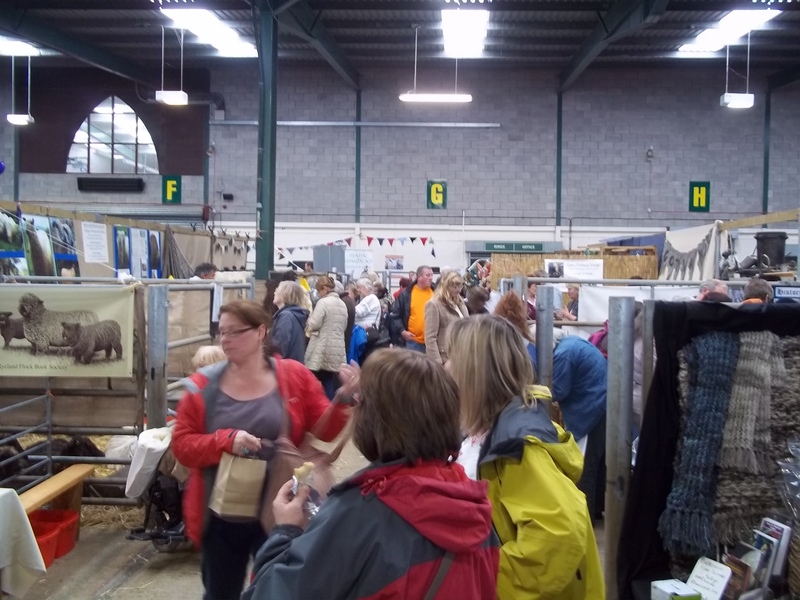 So, for the first time since World War II and the Foot and Mouth epidemic ten years ago, The Great Yorkshire Show has been cancelled. The apocalyptic rain we’ve been having since, well, forever, rendered the car parks useless. How glad am I then, my friend took me yesterday, when it was still open. 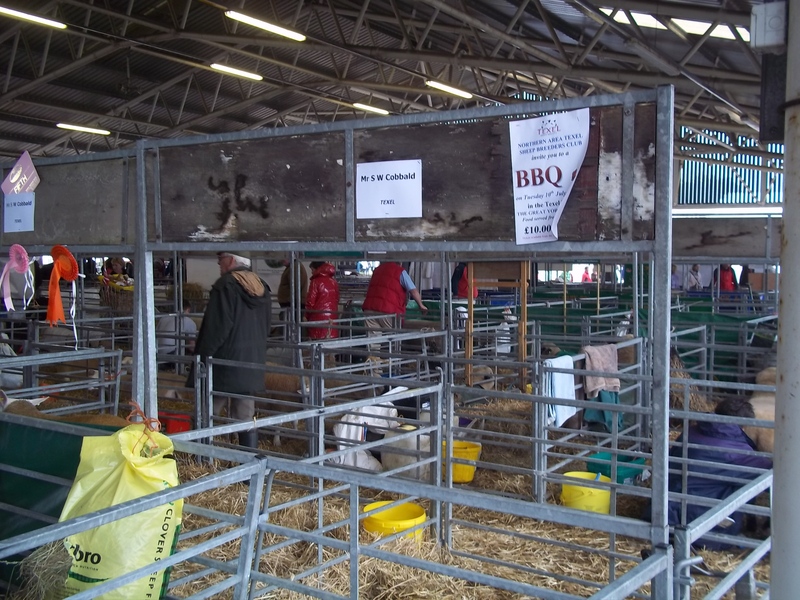 It was my first show and I looked over the itinerary the day before so I had some idea what I wanted to target, and yes, the sheep were number one! Goddamn they were cute. 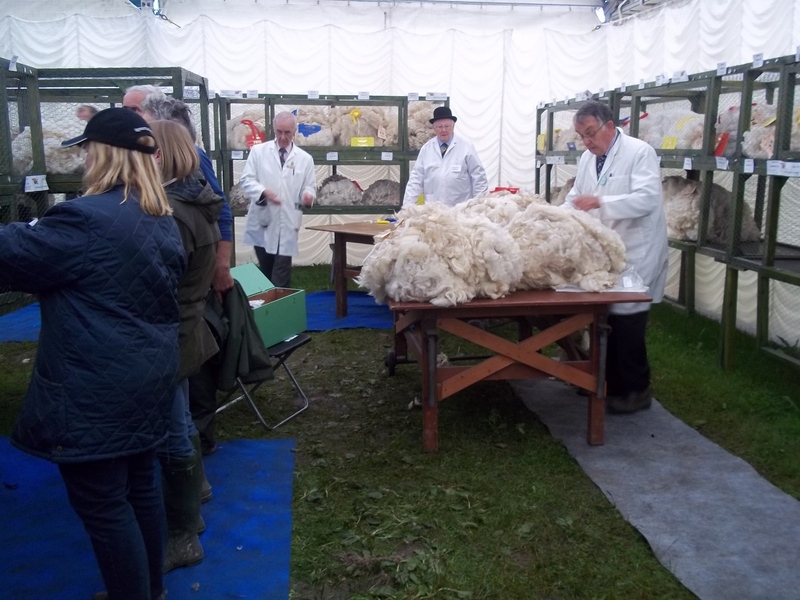 And as for the fleece tent, it was very hard to retain some dignity. I don’t know why they are all in cages, I think there was a mass escape attempt a few years ago. 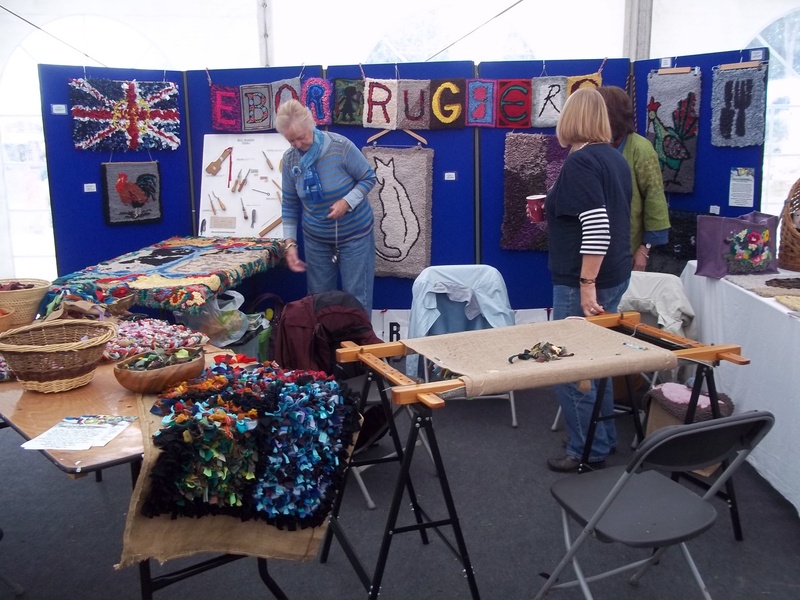 The other event I wanted to see were the Ebor Ruggers; one of their members was kind enough to pop by and say hello during the arts trail, so when I saw they were going to be there, I wanted to return the favour. They could not have been any friendlier, and I would very much like to join one of their meetings sometime. 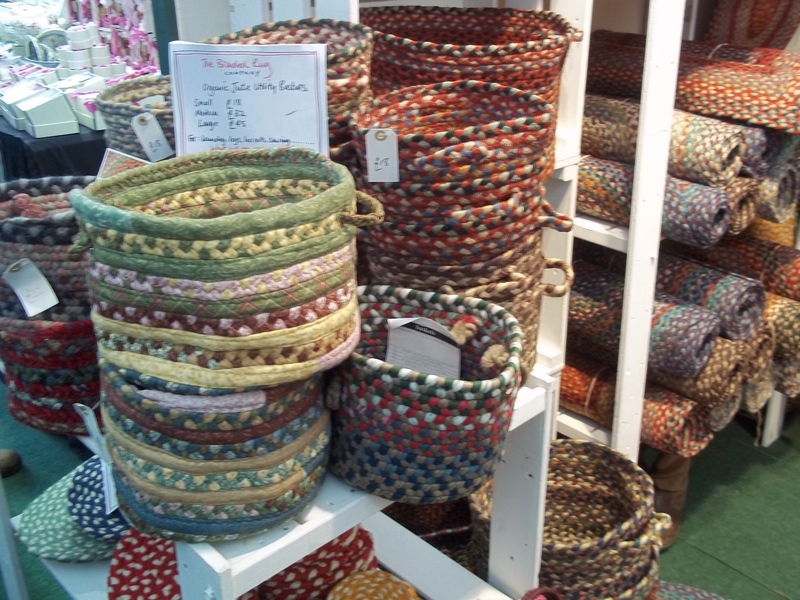 There were craft tents scattered all over the place and the most eye-catching stall for me belonged to the Braided Rug company. I must not, under any circumstances whatsoever even contemplate having a bash at this! Anyways, it was all a bit of a recce really, and I’m looking forward to next year’s if the rain has lessened by then. In the meantime I can only extend my sympathies to everyone who has no doubt worked long and hard to prepare for this event. 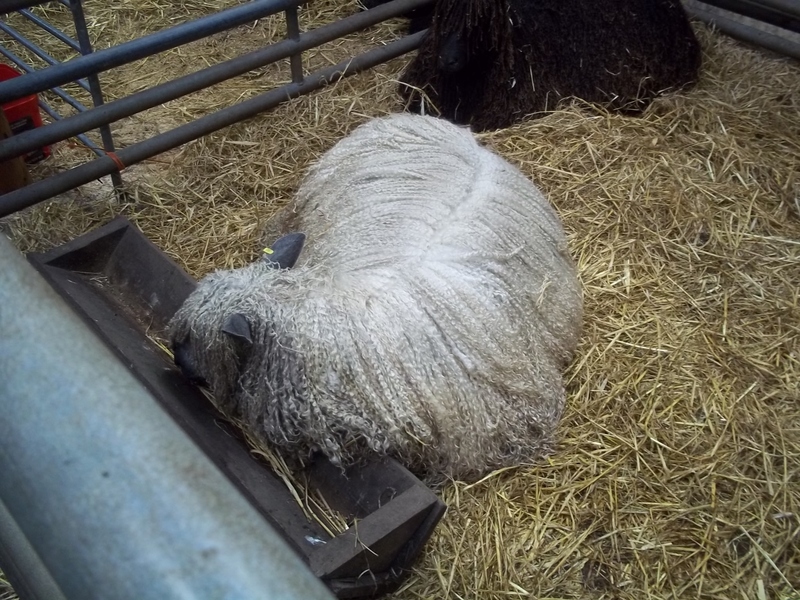 I will just add this from the sheep pens, it did seem a little insensitive …..
One thing that has started to make Mondays bearable is the thought of a Knit and Natter group I’ve started going to. It was set up and run by Heather, a lady whose determination and enthusiasm to get people knitting is boundless and very infectious. They meet in the Costa Coffee at Shipley College on Victoria Road on a Monday evening during term time, 5-7pm. 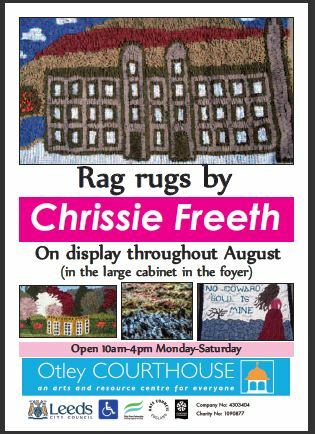 (There’s a Ravelry group here) It’s largely college staff that go but anyone can be guaranteed a very warm welcome. 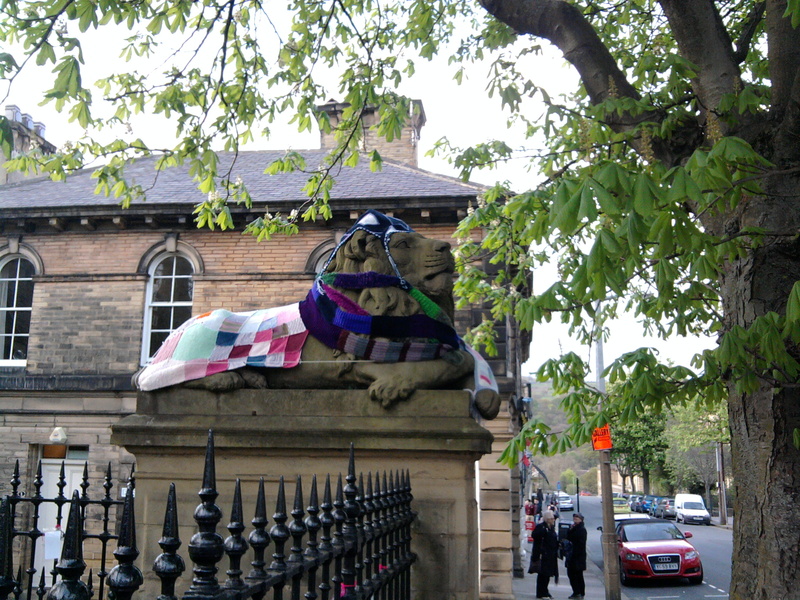 Heather has lots of ideas and plans, especially in the build up to the Saltaire Festival and she the group were behind the yarn bombing of the lions in the village during the Arts Trail. 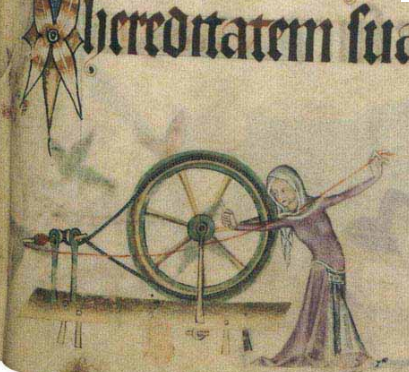 One fab outcome of this group for me is the rekindling of my love for spinning. To my shame Morag (my Haldane Hebridean) had been gathering a wee bit of dust but when a member expressed an interest in meeting her I was happy to take her along. It was great to get her going again and for other people to have a go. My problem was the unmitigated wrist-slitting, tear inducing horror that is handcarding. 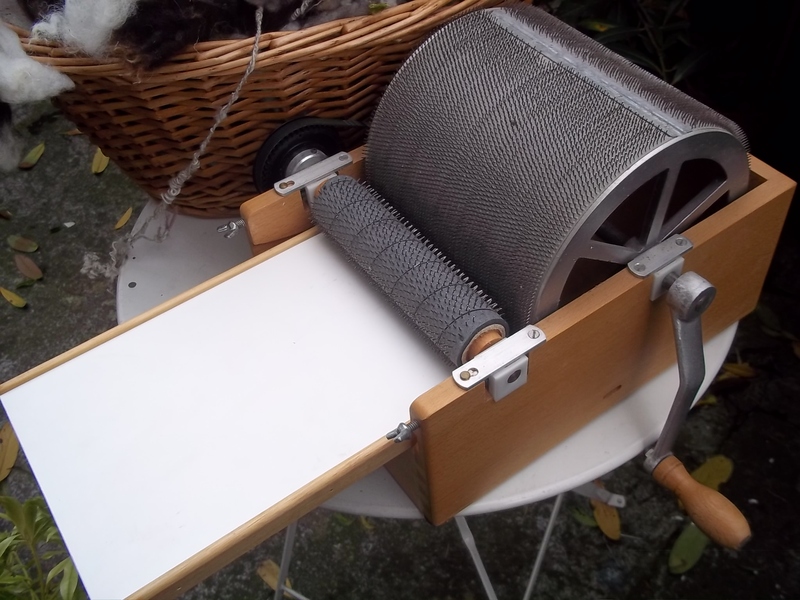 I’ve been shying away from the obvious solution, a drum carder, because of the cost but with some loot earned from the rag rugs I finally took the plunge and got my mitts on a lovely David G Barnett drum carder. I only hope I have the discipline to keep it in as good a condition as it arrived! 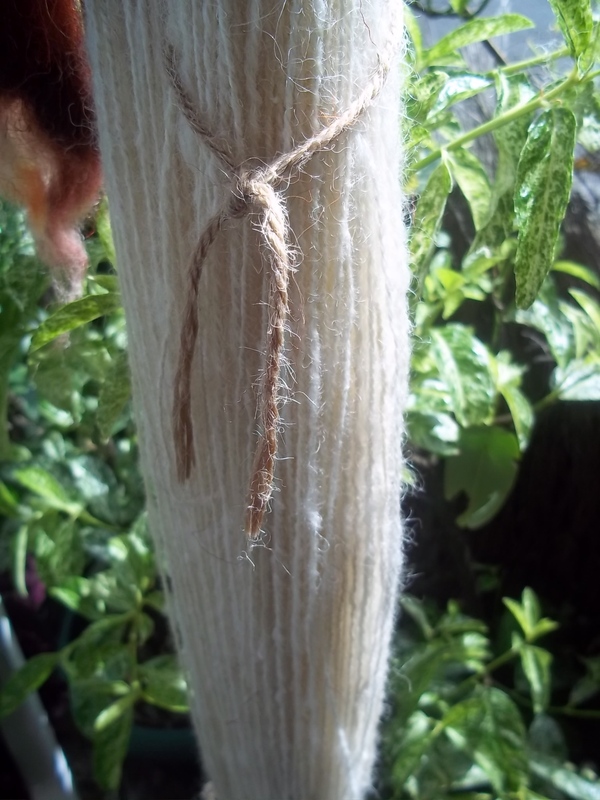 So this is my first batt; there are a few noils in it but it looks like the fleece might have had some second cuts in it so not my fault guv. 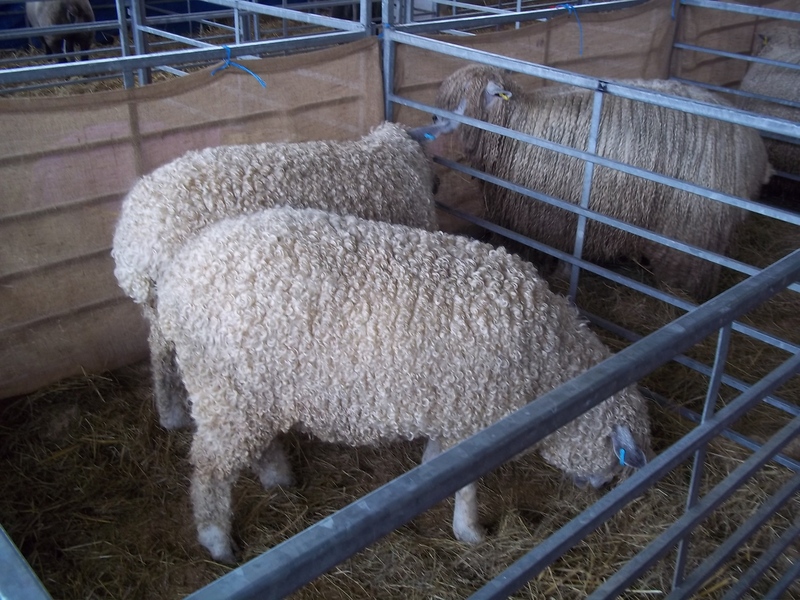 I do though need to be more careful in checking over the fleece in the future. 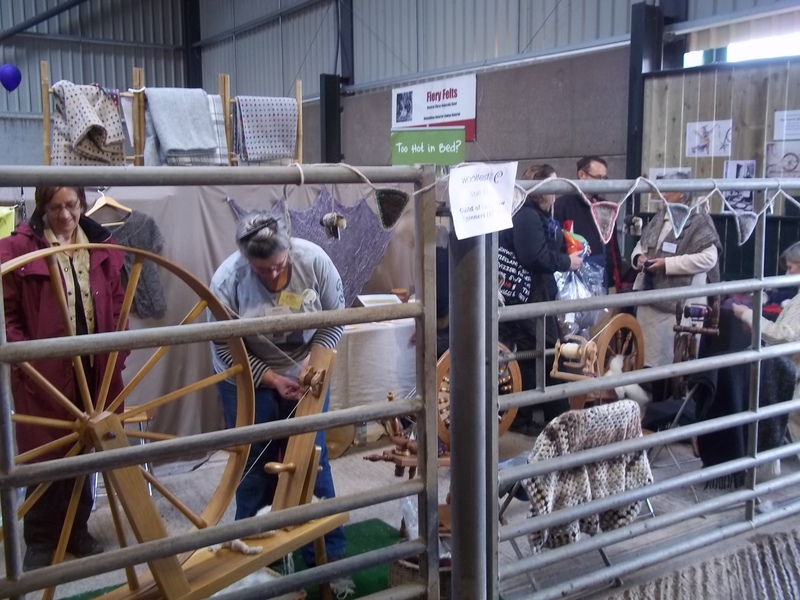 The UK spinners forum of Ravelry were a splendid source of advice but by far the best was to spin it anyway and call it rustic. 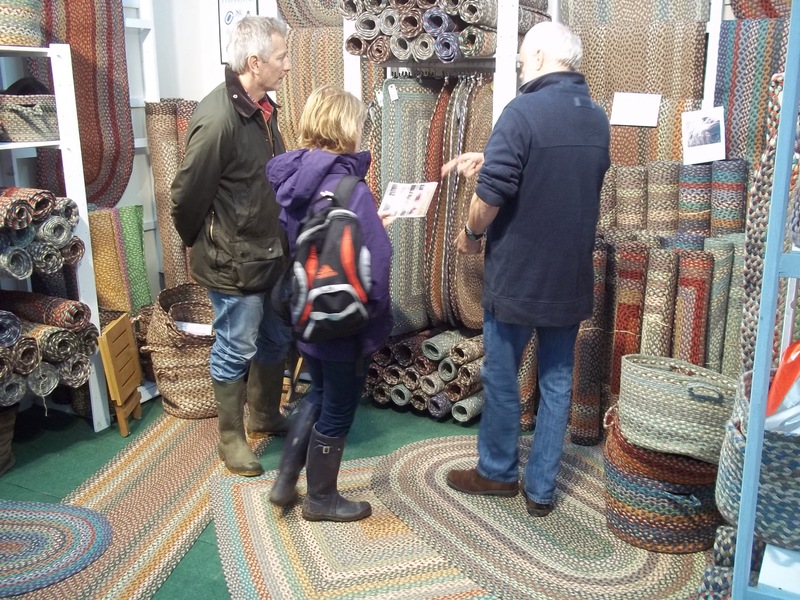 Love that – it’s not crap, its rustic! I’ve also been doing a great job in carding my knuckles. 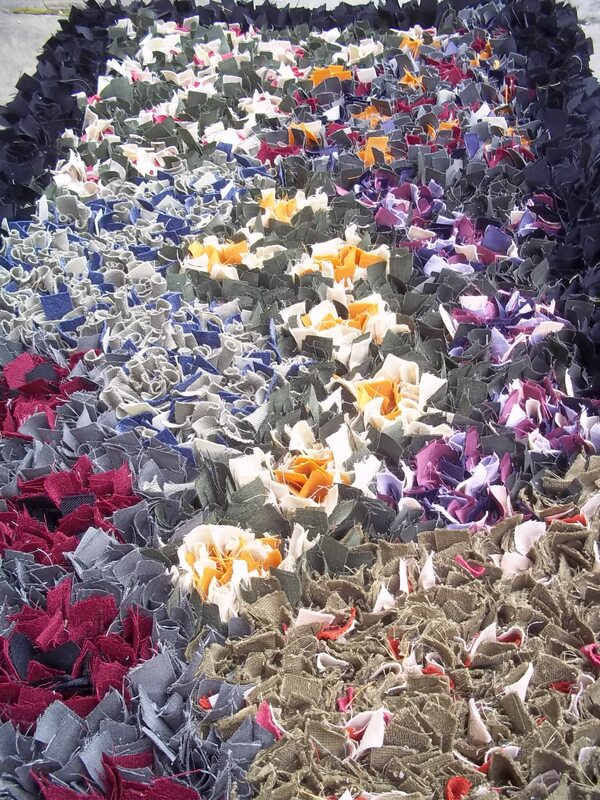 But should the nation be fearful all this means I have been neglecting the rug frame, fear not. Here’s one I finished off yesterday. It’s destined for a fab new shop in Shipley called Junc, and I’ll post more about that once I’ve gone down there with my camera. Ta ta for now! I filled a bowl three-quarters full of hot water – as hot as the tap would go – and added a good squirt of washing up liquid (a co-op version – Lime and Ginger as it was at my sink! The bowls are the value ones from Tesco). I wore washing up gloves and not least because the water was so hot. 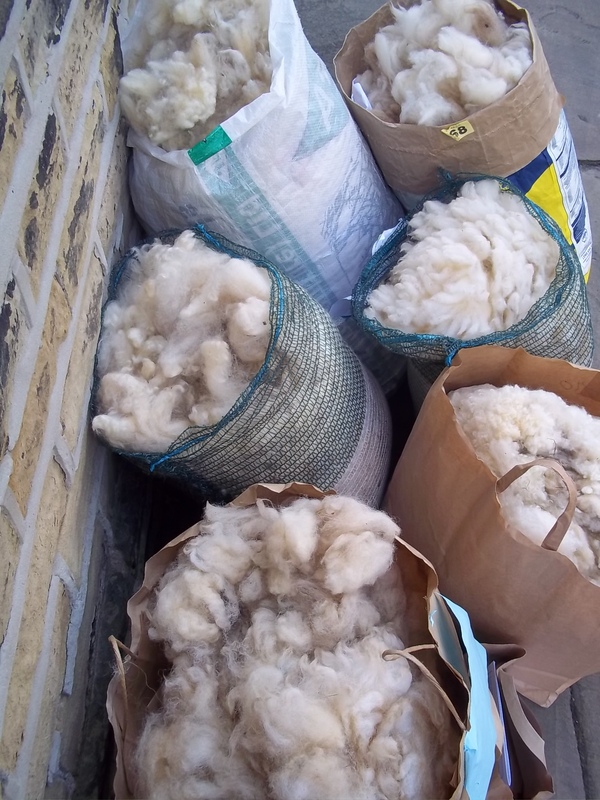 I pulled off a quantity of the fleece – not enough to fill the bowl, but a good foot and a half or so. I pushed it under the surface and that was it – I did not touch it again. After 45 minutes I filled another bowl with more very hot tap water but this time no washing up liquid. 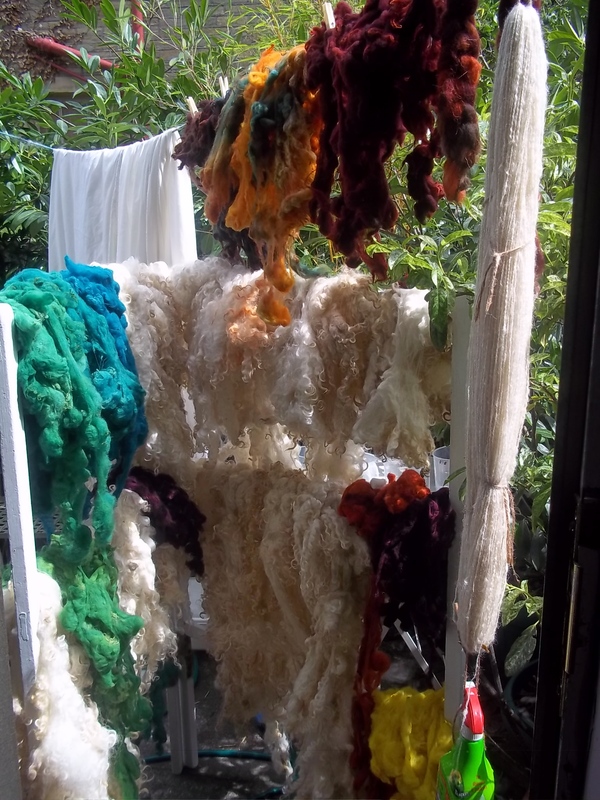 I lifted the fleece out of one bowl holding the weight of the fleece as the liquid drained away and then transferred it into the other bowl, again pushing it under the surface and then not touching it again. After half an hour I transferred it to another bowl just the same as before. 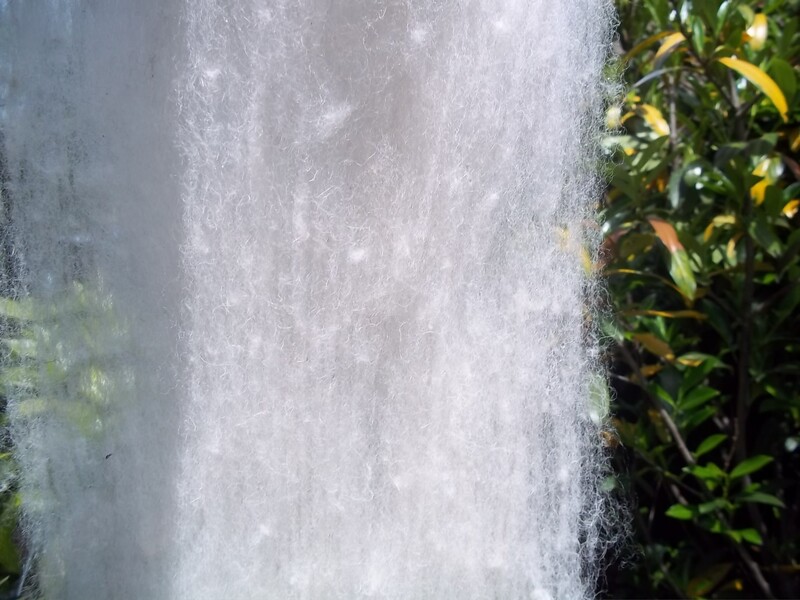 After another half hour I lifted the fleece into a pillow case and knotted the top and put it into the spin cycle of my washing machine. 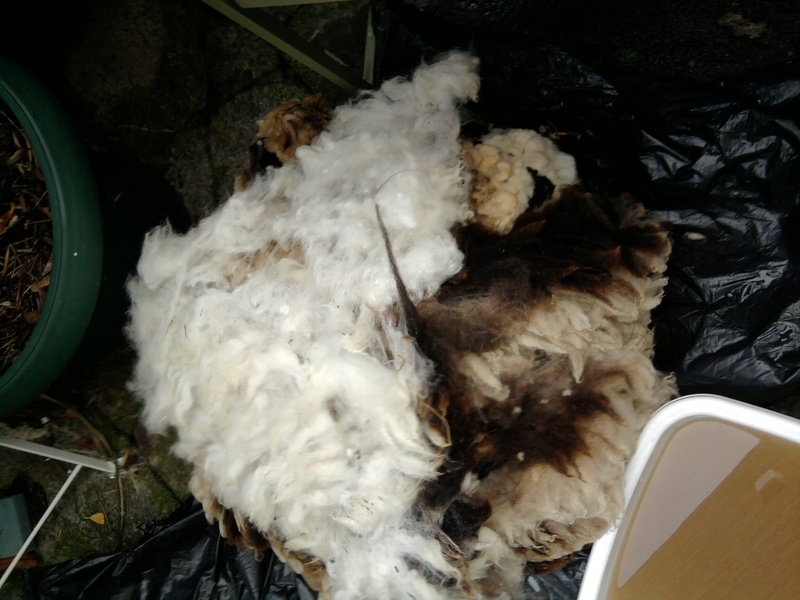 My scraggy lump of fleece ten minutes later was a soft pillow case full of fluffy white loveliness! 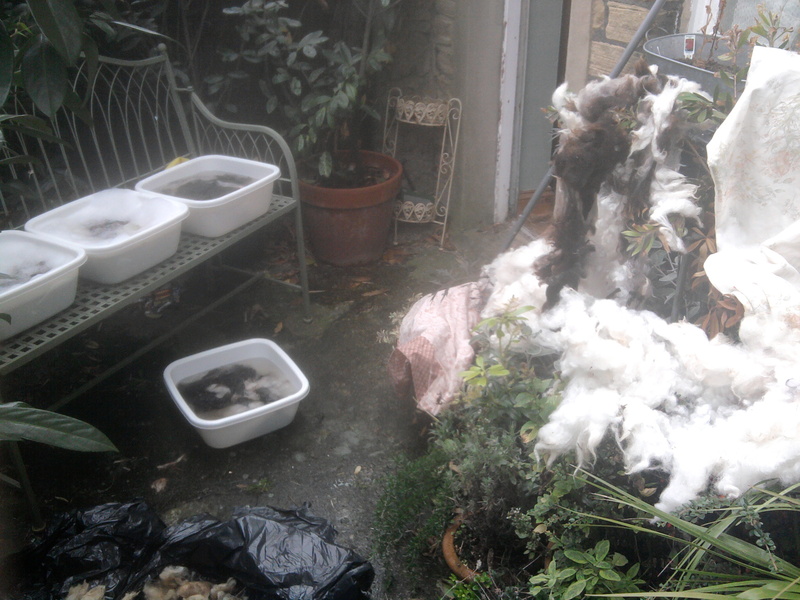 Whilst it wasn’t raining and not having a rack and the bench being covered with bowls, I laid the fleece on the plants around the yard, turning them over every now and then to dry off. Once the rain kicked in I let them dry in the house lying on a towel. 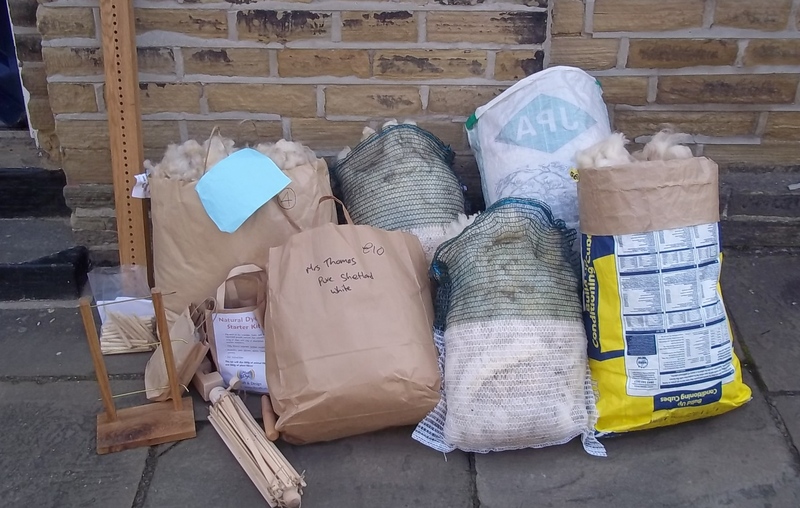 There still seems to be a few bits and pieces of debris amongst the fibres but I have been reliably informed they will absent themselves during the carding process. I have no idea if what I have done is right but it has worked well for me and I’m very happy with the result and it seems a good compromise. And at least it didn’t turn into felt!